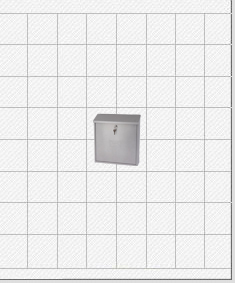 Attractive Silver post box made from high quality galvanised steel. Easy post removal via a full height drop down door with envelope motif. G2 Post Boxes	The Silver Severn Post Box by G2 is made from galvanised steel making it rust resistant and ensuring it is protected from harsh weather conditions when used outdoors. The Severn Mail Box incorporates a top loading letter slot suitable for A4 mail which is fitted with a protective flap to resist rain. The Silver Severn Post Box also includes a fixing kit and pre-drilled holes in the rear making it suitable for wall mounting.